This month's event is being hosted by Stevi over on her blog Two At The Most The theme is Guilty Pleasures. If you would like to participate, please write up a cocktail in this topic before Monday, October 13th at midnight. I will compile a list of cocktails posted and email them to the organizer. 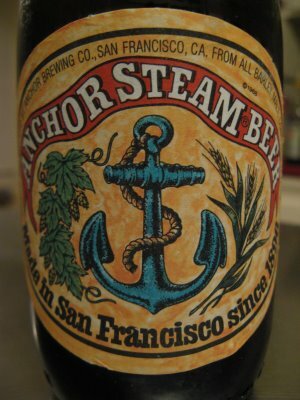 To be honest, I was kind of a long time coming around to Anchor Brewing’s beers. I’d drunk Anchor Steam on and off over the years, of course. However, it always seemed a bit expensive for being what amounts to a perfectly fine beer. I’d always skip over it for beers with stronger character. Ales and IPAs. Things like that. However, some friends always mentioned what a good beer they thought it was, and kept it in their fridge, so I continued to try it. As I learned more about Fritz Maytag’s contributions to craft brewing, (and craft distilling,) in America, I also came to appreciate Anchor Steam’s qualities. I think, especially, taking the brewery tour one day a few years ago, made me understand how close what is in the bottle is to the process. Just walking around the brewery taking in the smells. Of the hop room and the fermenting tanks. It is all there. It is a very honest beer. They do flash pasteurize and filter before bottling, but what you get is very much a craft beer, albeit on a slightly larger scale. Another thing I appreciate is that it isn’t an extreme beer. It’s a nice malty California Common. Not so strong that you can’t drink a few, but not so weak as to be, “@#$%ing near water,” as the Australians in the Monty Python skit say of the often valid comparison between many American beers and making love in a canoe. Anyway, it’s my favorite beer to drink when we’ve got guests coming over, and I need to keep it together enough to play bar tender and cook. 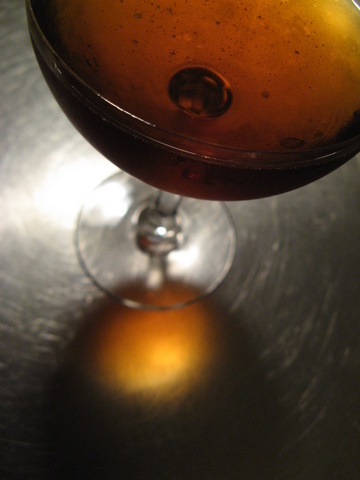 Of course, at the end of the evening, after all the guests have gone home, it’s always nice to reward myself with a tasty Manhattan Cocktail. So, I'm not sure exactly which is the guilty pleasure! Should I feel guilty? I suppose so, but when your SO lives in a drafty, cold, grad student apartment in a converted carriage-house, there is nothing better than hot chocolate with rum. Now years later, as fall approaches, this not-so-young man's thoughts turn to liquid comfort. So give me Swiss Miss and Meyer's - I'll ignore your sniggers. But if you like it fancy, I also like real milk, cocoa, and sugar. Add 1 oz Gosslings Black Seal and 0.5-1 oz Gran Galla, depending on how sweet you like it and how much sugar you add. Put it in a favorite hand thrown mug with a well balanced handle. And go ahead, put some whip cream on top. I've got to back up Morgenthaler and say Pina Coladas. Yes, I know Coco Lopez looks like pomade, or Crisco, or both mixed together. And I know it smells like Coppertone. But add pineapple juice and some Goslings (and preferably a beach) and I'm a happy girl. My guilty pleasure is simply a Rye & Root Beer or Bourbon & Diet Coke. I always feel bad pouring soda in with good whiskey, but I also feel like I redeem myself by adding a few drops of bitters. That's my logic and I'm stickin' to it. So give me Swiss Miss and Meyer's - I'll ignore your sniggers. But if you like it fancy, I also like real milk, cocoa, and sugar. Add 1 oz Gosslings Black Seal and 0.5-1 oz Gran Gala, depending on how sweet you like it and how much sugar you add. Put it in a favorite hand thrown mug with a well balanced handle. And go ahead, put some whip cream on top. It was only last Winter that I first tried the hot-chocolate-and-orange-liqueur thing . . . oh my. On that note a guilty winter pleasure that I always enjoy hot chocolate mixed with a little red pepper, cinnamon, nutmeg, and a generous shot of tequila.... people I tell this too make faces at least the ones who have not tried it.